When the weather turns cold, you want a salad that brightens your table and can stand up to all those stews and roasts you’ll be serving. Note: This recipe is part of our series for Serious Eats. You can also find the recipe and many others on their site. Once the weather turns cold it becomes harder and harder to keep salads interesting. Most of our favorite add-ins are a distant memory (I’m looking at you, glorious heirloom tomato). A trip down the produce aisle, or even the farmer’s market, can feel more like a challenge than an inspiration. But this is when, with a little creative thinking, great combinations are born. In this case, we use gorgeously sweet, meltingly tender roasted cipollini onions to soften one of our favorite winter vegetables, red cabbage. Red cabbage (like our other winter veg paramour, the brussels sprout) is completely undeserving of its frumpy reputation. Like a rom-com actress who takes off her glasses and is suddenly a knock-out, red cabbage is fantastic when prepared well (i.e., not boiled or pickled into submission). The fact that it also happens to be extremely nutritious is an added bonus. It’s packed with vitamin C, vitamin K, fiber and phytonutrients; raw preparations, like this recipe, maximize these positive health benefits. But the star of this salad is the cipollini onions. If you’ve never tried them, now is the perfect time. Once hard to find, these small UFO-shaped onions are popping up all over the place, and this is a good thing because they’re amazing. They have a higher sugar content than regular white or yellow onions, which means that they brown beautifully and turn even sweeter as they caramelize. We often cook them with meat, particularly pork and duck, but in this case, they lend their signature sweet flavor to a vegetarian salad. If you find the onions too difficult to peel, you can plunge them into boiling water for a minute, then drain them and rinse with cold water—you’ll find the skins much easier to remove. Once they’re peeled, just toss them with oil and a few sprigs of thyme, and throw them in the oven until they’re very soft and well browned. A note about the cheese: aged goat cheese has a sharper, more pungent flavor that adds a layer of depth to this salad but fresh goat cheese (chèvre) would be a fine substitute. If goat cheese isn’t your thing, a mild, creamy blue would also be a fine choice though you could also just leave it out. 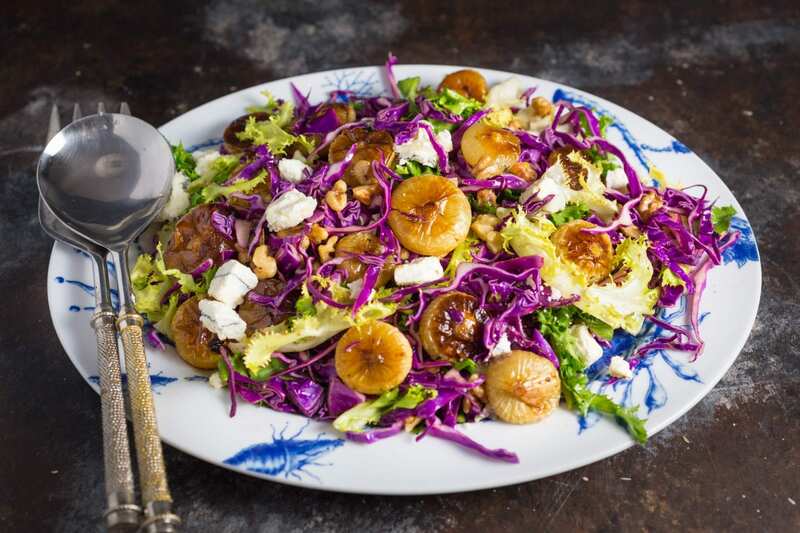 This is a salad that celebrates contrasts in flavor and texture. 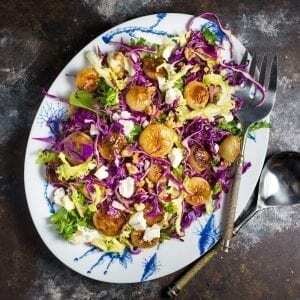 Soft onions, crunchy cabbage, spicy chicory, tangy goat cheese. To me, that’s the key to a great salad – choosing ingredients that together add up to more than the sum of their parts. It would be a great accompaniment to a Thanksgiving Turkey or a Christmas Roast Beef … the only danger is that it might steal the show. Preheat oven to 350°F (177°C). In a baking dish, arrange onions in a single layer. Drizzle with vegetable oil and season with salt and pepper. Add thyme sprigs and toss until onions are evenly coated. Roast, turning twice, until onions are soft and well browned, about 40 minutes. Keep warm. In a small bowl, whisk together vinegar, garlic, and extra-virgin olive oil. Season with salt and pepper. Place cabbage and chicory in a large bowl and toss with just enough dressing to coat. Add warm onions and walnuts and toss again, adding more dressing if needed. Transfer to a serving bowl or platter and top with goat cheese. Serve.